“After revisiting the electric guitar pioneers on my last studio album ‘Looking Forward Looking Back’ I spent some more serious study time on the styles of Robert Balfour, Fred McDowell and Charlie Patton. It gave inspiration to my song-writing but I wanted to take these styles on to a new sound, a big dramatic sound, which has the dynamic extremes of rock music but works with acoustic and natural sounding instruments. This puts a lot on the musicianship of the players, and it took 2 years to find the right people. My Italian luthier friend Bruno Bacci believed in me and the project and helped recruit the band. He then did an amazing job bringing the whole project to fruition, overseeing every detail on the production side.. As well as new songs I also brought some songs in from my back catalogue, not strictly blues, but with the same scope for dynamic arrangements. Working with great musicians has made the ideas come alive in a more exciting and fulfilling way than I could have imagined” said Eddie. Nigerian-born percussionist Olalekan Babalola (David Byrne, Damon Allbarn, Cassandra Wilson) stayed with the project after the UK trials to see it through to fruition. Travelling to Italy they joined the full band, and Big Red Radio were set up in the beautiful walled-Tuscan town of Barga, rehearsing for a week in the theatre that was to host their debut. 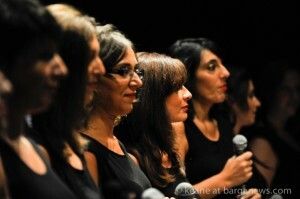 The superb Jubilation choir from nearby Livorno, were brought in adding Gospel to the blues/pop/soul mix. From the first morning of rehearsals, it was clear something special had been born. The buzz got out around the town and locals increasingly gate-crashed for a sneak preview. A high-energy, emotional roller-coaster of a sell-out show was the result, with these top-drawer musicians forming a perfect meeting of minds and spirits with Eddie. 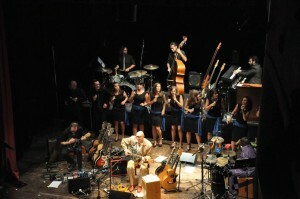 The success of the “Live in Tuscany” recording left all keen to get the project on the road. The core touring band is now a 6 piece with optional guest appearances of percussionist and Gospel Choir for bigger productions. Band Members Eddie – guitars vocals harmonica, Alberto Gurrisi – keyboards, Luca Giovacchini – guitar, mandolin, banjo, Michela Lombardi – vocals, Matteo Sodini – drums, Marco Bacci – bass.